I’ve long since given into the temptation to hand over my iPad to my children. Not surprisingly this has resulted in it being dropped, sat upon, smeared with goo and generally abused. What is surprising is that it’s survived. So I was eager to try LeapFrog’s just announced rugged-ized kids' tablet, the LeapPad. The tablet, unveiled Tuesday, will be available for preorder today, and costs $99.99. The LeapPad has a 5-inch touchscreen housed in a case that feels like it will take a beating. The 480-by-272 display is bright and high quality for a kid's toy, but noticeably lower resolution than adult smartphones and tablets. It's also a resistive screen, so you have to exert a little pressure when swiping or using the included stylus. There’s a built-in VGA camera (640-by-480 pixels) for taking photos and videos, an accelerometer for tilt control in games and a cartridge slot for playing LeapFrog's Leapster Explorer titles. When you turn on the LeapPad, you’re prompted to customize it with your name, picture, wallpaper and virtual pet. The Pet Pad, which lets you create and care for your pet, is one of four apps that come preloaded on the device. There’s also Story Studio for producing custom e-books, Art Studio for creating art projects with the expected assortment of stamp tools, colored pencils and special effects, and My Stuff gallery for storing photos, videos, e-books and other creative projects. There’s plenty of game play with the titles and activities that come preloaded. I especially like the Story Studio. The app comes with an "All About Me" book, which kids can fill with custom pages about their birthday, friends, family, favorite things, expressions, pets and plans for what they want to be when they grow up. Kids add their own artwork and sound effects and then parents can share the e-books through email and Facebook. Photos and videos taken with LeapPad can also be uploaded and shared. 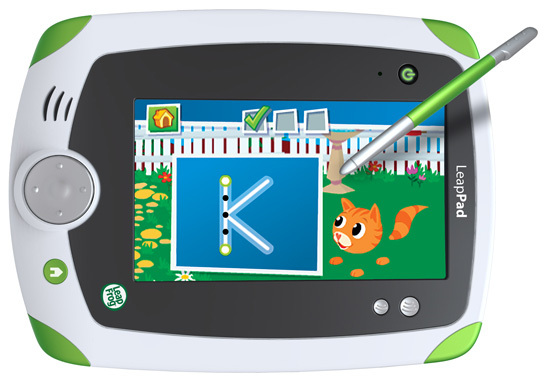 One free download from the LeapFrog store is also included with the LeapPad. At launch there will be more than 100 compatible titles, including games and creativity apps, interactive e-books, videos from LeapFrog and Discovery Kids, and flash cards. While there is a cartridge slot for backward compatibility with Leapster Explorer titles, all LeapPad titles will be downloaded to the device’s 2 GB of internal memory through the LeapFrog Connect software. LeapPad will be available Aug. 15. Pricing for videos, interactive e-books, games and creativity apps and flash cards is not yet set, but will range from $5 to $20.